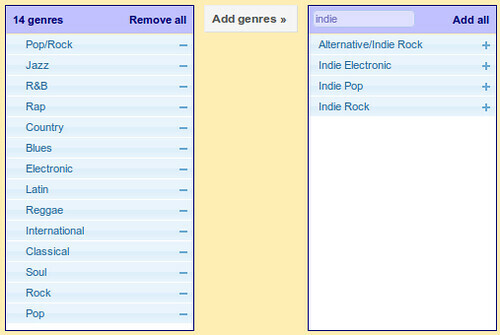 As part of the work to allow arbitrary genres to be added to the allowed genres list I decided to simplify the genre chooser. I perceived three main problems with the genre tree as it was: it was difficult to find a particular genre you might want to add, it was pretty overwhelming in the number of genres it displayed and finally it was dog slow (particularly on IE). 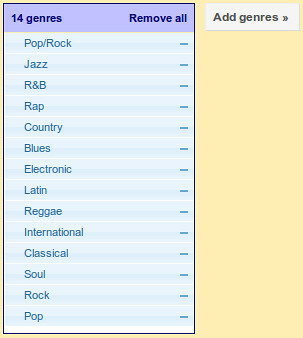 Click the '+' to move genres from the available list to the allowed list. I had wanted to add the ability to add genres into this release but unfortunately I ran out of time. The next release in a fortnight should have this ability. I also added more detail to the activity stream, to show more about what bliss did to fix your music collection. For instance, where art was missing, the activity stream now lists from where art was downloaded.